Lest I forget, here is the pattern for this mitten, based loosely on the DIY channel's Knitty Gritty pattern. White yarn is Paton's Be Mine in Wuzzy White, variegated yarn is Lion Chenille. Using size 5 double pointed needles, cast on 24 stitches of the white yarn onto 3 needles. Sew through the remaining stitches, go back and sew any "holes" at the bottom of the thumb. 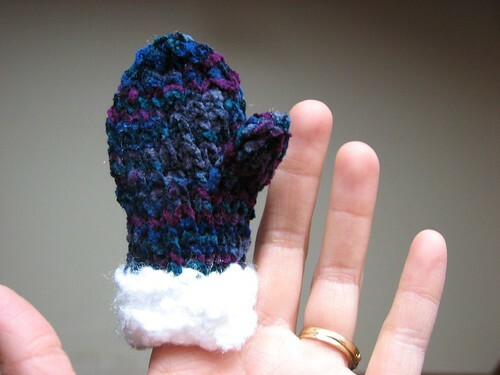 For the second mitten, put the thumb on the opposite side! I think my next pair of mittens should be even smaller, so I may try 16 stitches, and only 2 stitches on waste yarn for the thumb. It's only May, but I know I have to get cracking if I'm going to give these out as gifts for the holidays.